This pretty pattern has just been put on offer over at KnitPicks. 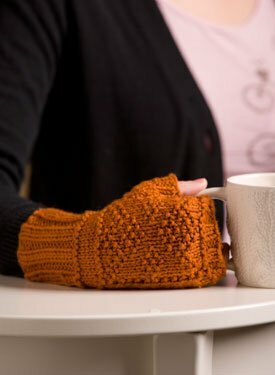 I’ll probably make them w/o the thumbs, because I like to wear mitts while knitting, and the thumbs often get hung up in my work. I like this shade of gold, too. Worsted weight yarn, on #6 – 9 (US) needles (4.0mm-5.5mm).